Feed 45 Head In Less Than One Minute! You can fill your CSF Cart heaping full to increase the rated bushel capacity. 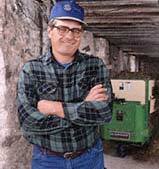 These rugged Carts can handle up to 2000 pounds of feed. You'll be ready to begin feeding quickly, quietly and efficiently with your CSF Forager™ Cart's ergonomic, one handle controls. The full-length discharge opening and convenient one finger controls means you'll be done feeding in a short amount of time. 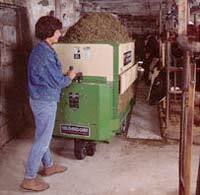 Feed discharges ony when you want it to, allowing you to feed a little or a lot at each stanchion. CSF Forager™ Carts are designed to be safe and simple. No beaters or augers required. 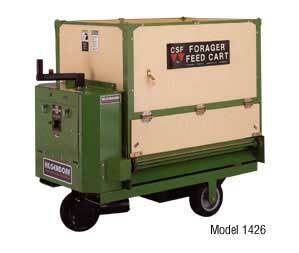 These time tested features make CSF Forager Feed Carts your best Value. 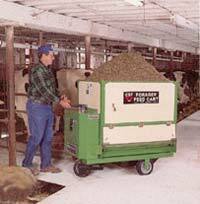 1400-1600 series Carts feature an ergonomic control handle for travel and feed discharge functions. Travel direction and speed selection controls are located within easy reach just below. This flip-down panel gives you quick and easy access to the electrical system and discharge drive for easy maintenance. 1400-1600 series CSF Carts feature hard wired electrical system employing heavy-duty starter solenoids. Recommended standard marine, 12 volt deep cycle batteries are housed in this convenient roll-out tray. Low to medium speed Carts require two batteries. High speed Carts use three batteries. The wide discharge door insures quick and even feeding. Your feed stays in the Cart until you activate the discharge conveyor. You won't find potentially dangerous augers, beaters, or complex cross conveyors here. 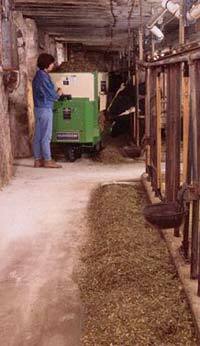 You'll never have to deal with gas engines that fail to start in a cold feed room, or sluggish, leaky hydrualics. These common maintenance headaches are avoided. Direct drive to the fron steering wheel means no belts, pulleys or clutches to maintain or replace. Notice the solid, puncture-proof tires. You're able to maneuver with a simple twist of your wrist. CSF puts the power directly on the steering wheel for instant and positive response. Our dependable high torque motor, coupled with the high reduction worm gear drive, delivers power where and when you need it. Based on feeding twice per day. "My 1632 CSF Forager Cart saves me over 185 hours a year in feeding time... and that adds up to serious savings each and every year. It's proven to be dependable and a rock solid value."